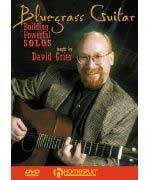 Here is an award-winning guitarist's blueprint for taking a successful bluegrass solo. On this excellent lesson, David Grier outlines the wide variety of techniques necessary to establish solid flatpicking style and play hot bluegrass guitar. He takes all the elements of his dazzling style - slides, hammers, pulls, crosspicking, pick-and-fingers technique, bends, double-stops, raking and other devices - and pulls them together into outstanding solo pieces. Before long, you'll be digging into arrangements of well-known bluegrass tunes such as Liberty, Bill Cheatham, and a spectacular version of Nine Pound Hammer, incorporating all the elements in David's arsenal of licks to create your own instrumental breaks. Learning to play Grier originals, such as the haunting Engagement Waltz and The Meeting, will give you additional insights and direct you toward reaching your guitar playing potential. This top Nashville guitarist, Pat Flynn, breaks down his method for improvising across the entire guitar fingerboard, teaching how to create guitar solos through finding “chord centers” in every position. Pat includes new ideas for adding harmonies within chords, improvising blues and minor-key songs, and innumerable tips on playing technique.